Shipwright Joe Connor smashes a bottle of champagne against the bow of 1889 bugeye Edna Lockwood to christen her before her return to the Miles River on Saturday, Oct. 27, 2018. Edna Lockwood returns to the Miles River on Saturday, Oct. 27, 2018 in front of a crowd at the Chesapeake Bay Maritime Museum. 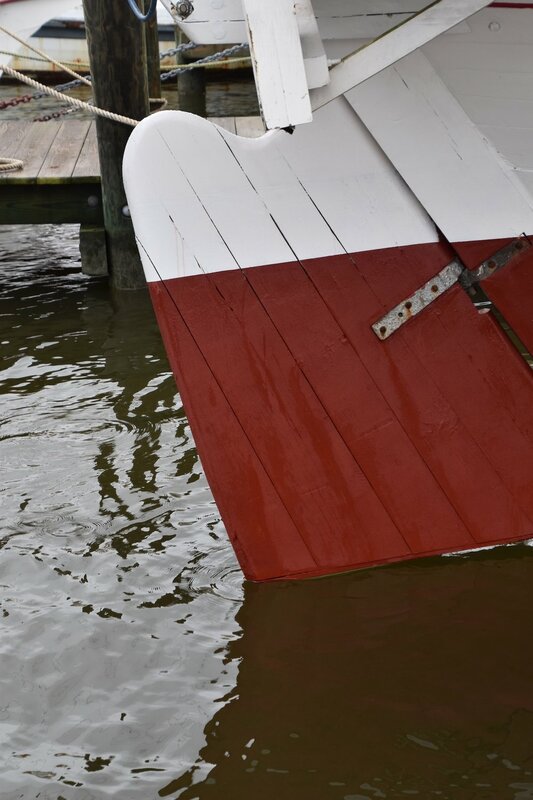 Bugeye Edna Lockwood’s rudder touches the Miles River again on Saturday, Oct. 27, at the Chesapeake Bay Maritime Museum. Rev. Kevin Cross from the Church of the Holy Trinity in Oxford, Md., uses holy water to bless 1889 bugeye Edna Lockwood before her return to the Miles River on Saturday, Oct. 27, 2018. Also pictured are Shipyard Manager Michael Gorman, far left, and CBMM Kristen Greenaway, right, who offered brief remarks as part of the ceremony. Edna, queen of CBMM’s floating fleet, has spent the past several years having her nine-log hull completely replaced by CBMM shipwrights and apprentices. All work was done in full public view in St. Michaels, Md., and in adherence to the Secretary of the Interior’s Standards for Historic Vessel Preservation. Shipwright apprentices working on the project were generously supported by the Seip Family Foundation and the RPM Foundation. Built in 1889 by John B. Harrison on Tilghman Island for Daniel W. Haddaway, Edna Lockwood dredged for oysters through winter, and carried freight—such as lumber, grain, and produce—after the dredging season ended. She worked faithfully for many owners, mainly out of Cambridge, Md., until she stopped “drudging” in 1967. In 1973, Edna was donated to the Chesapeake Bay Maritime Museum by John R. Kimberly. Recognized as the last working oyster boat of her kind, Edna Lockwood was declared a National Historic Landmark in 1994. Edna is the last historic sailing bugeye in the world, and will undertake a heritage tour around the Chesapeake Bay during summer 2019, funded by the National Park Service. To learn more about Edna Lockwood and what’s next for the Chesapeake Bay Maritime Museum’s Shipyard, visit cbmmshipyard.org.